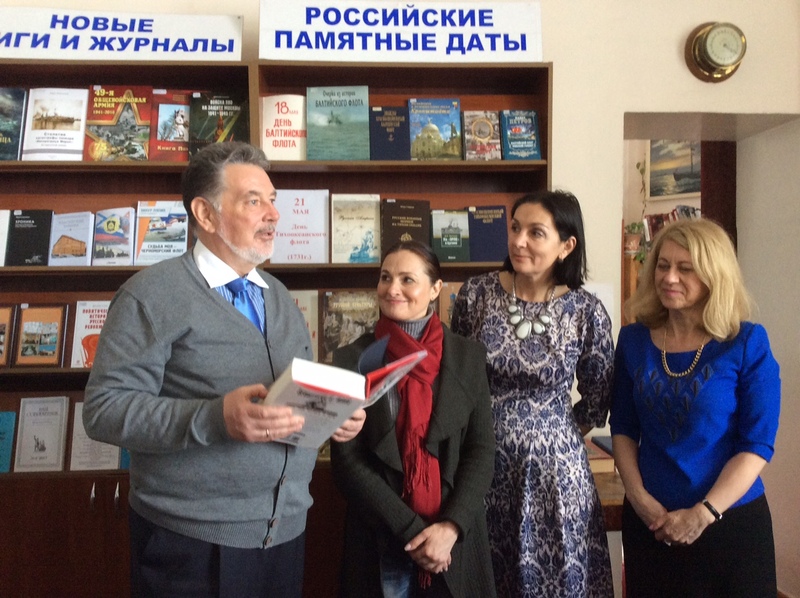 The Director of the Lazarev Naval Library, Leonid Mikhailovich Shcherbakov, with Ms Tanya Bukharina and two members of the library staff. Finally, the first copies of Sevastopol’s Wars: Crimea from Potemkin to Putin were delivered to Sevastopol yesterday, Wednesday, 24 May 2017. In June 1822 the first fleet library was opened, funded through a subscription of one kopek per rouble of pay, representing a 1 per cent levy. Originally a small store of books was housed in a dwelling owned by a certain Mr Tisdale, an Englishman who had once served in the Black Sea Fleet. 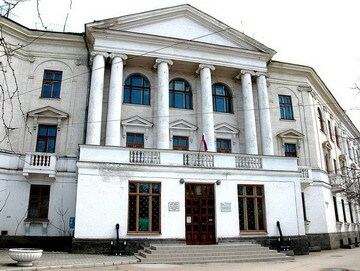 Under the energetic direction and support of Admiral Lazarev, construction of a proper library started in 1837. Unluckily, it burnt down only eight months following its opening on 14 November 1844. History does not record the fate of the books. Undeterred, the fleet’s commander-in-chief and governor of Sevastopol raised new funds. Within two years, construction of a completely new building on the city’s central hill was under way, opening in November 1849 to great ceremony. According to a British resident of Crimea and frequent visitor to Sevastopol during the early 1850s, a certain Mrs Andrew Neilson, this impressive building was ‘furnished very handsomely with sofas, carpets, and other articles from England, and contains an immense collection of books in all languages’. Misfortune was again to strike the Black Sea Fleet library when it was badly damaged during the Allied bombardments of the Crimean War. During this conflict the dignified building had done serious military duty, serving as one of Sevastopol’s advanced dressing stations for the many Russian wounded, in which toiled the famous Russian surgeon Nikolay Ivanovich Pirogov. Today only a remnant of the old library survives on Frunze Street, namely the beautiful octagonal Tower of the Winds, supposed to be modelled on the ancient Athens Marble Tower. Each of the eight friezes of Sevastopol’s copy features a bas-relief of a mythological figure, including Boreas for the northern winds and Zephyrus for the western. Following the Crimean War, the library was re-established in Nikolayev and remained there for thirty-five years. The famous Naval Library in Sevastopol named after Admiral M. P. Lazarev. In 1890 an entirely new Black Sea Fleet library was opened in central Sevastopol at a fresh site on Nakhimov Prospekt, only for it to be almost completely destroyed during the Second World War. Rebuilt in the same fine neo-classical style, the ‘Maritime Library of Admiral M. P. Lazarev’ remains an important educational and historical research institution of the Russian Federation in Sevastopol. Along with the square named after him, this fine building (and the professional study undertaken within it) provides a richly fitting memorial for a man, patriot and sailor, who devoted his life to the Russian Navy, its Black Sea Fleet and the city of Sevastopol. In his extensive, semi-official history, The Invasion of the Crimea, Alexander William Kinglake generously wrote of ‘the love and reverence with which the seamen [of the Black Sea Fleet] clung to the memory of the commander [Admiral Lazarev]. 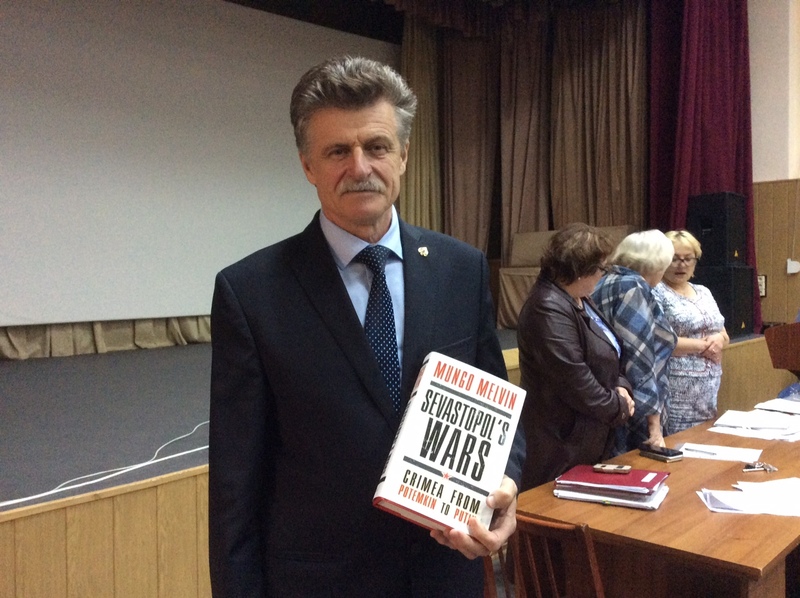 Director of the State Museum of the Defence and Liberation of Sevastopol, Mr Nikolay Ivanovich Museienko, holding a copy of Sevastopol’s Wars. This highly impressive building houses a foreground of accurately reconstructed fortifications and guns, which lies immediately in front of a circular vertical canvas, 115 metres long and 14 metres high. So skilfully is the whole battle scene designed and presented that it is extremely difficult for a viewer, standing on a raised platform in the middle of the building, to discern where the figures of the foreground end, and where the individual portraits on the canvas begin. For those who have witnessed a similar construction at the Waterloo battlefield in Belgium, the Sevastopol model is far grander and several times more effective, such is the meticulous attention to detail and perspective. 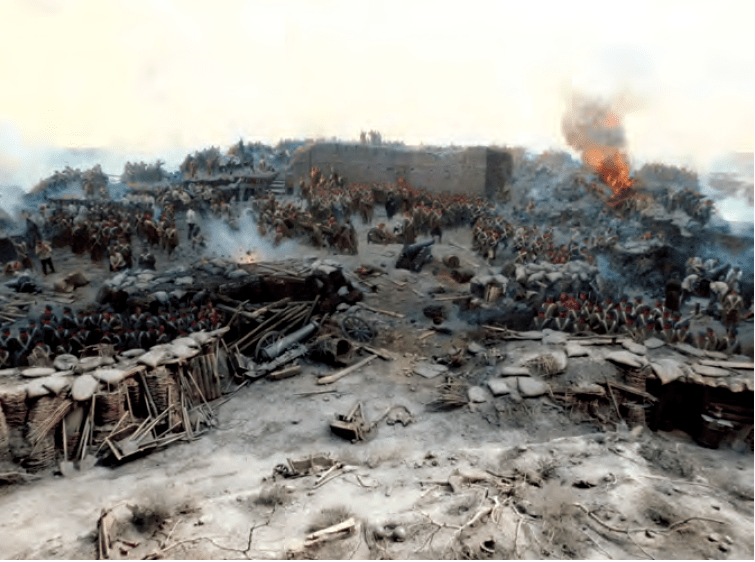 The snapshot of battle, so accurately and vividly depicted in the Panorama, represents the high point of the Russian defence on 6 (18) June 1855 with the repulse of the Allied attacks on the Malakhov and the Great Redan fortifications. The vivid battle scene depicted in the Panorama Museum, Sevastopol, shows the defence of the Malakhov Tower on 18 June 1855. Visitors observe the scene as if they were standing that day at a central point on the summit of the Malakhov Hill, one now occupied by the monument to Admiral Kornilov. Franz Rubo was the principal artist of the Panorama. Born in Odessa of French origin, he lived for most of his working life (1856–1928) in Germany. Assisted by two other painters and twenty students of the Bavarian Academy of Arts in Munich, Rubo took three years (1902–04) to complete the work. In parallel, V. A. Feldman, architect, and O. I. Anberg, military engineer, designed and constructed the building to hold the great canvas. 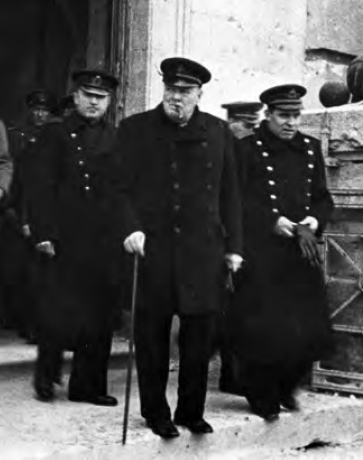 Prime Minister Winston Churchill leaving the badly damaged Panorama Museum on 13 February 1945. 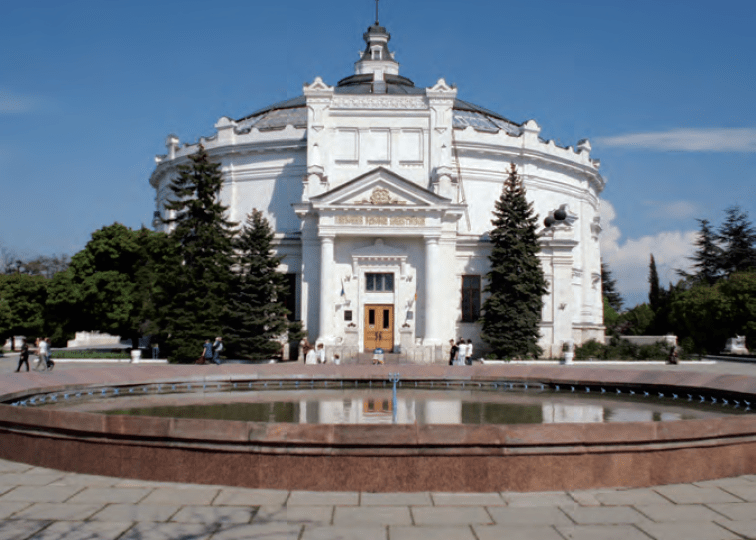 The Panorama Museum, Sevastopol, commemorates the defence of the city during the Crimean War. Both the Lazarev Naval Library and the Panorama Museum have requested further copies of Sevastopol’s Wars. In the meantime, I thank the directors and staff of both institutions for their interest and assistance in the research and writing of the book, and not least to Tanya Bukharina for presenting the copies.